Angeline Rodriguez graduated from MSU, but her work continues to make an impact here. Each year, Missouri State University has a Distinguished Thesis Competition. 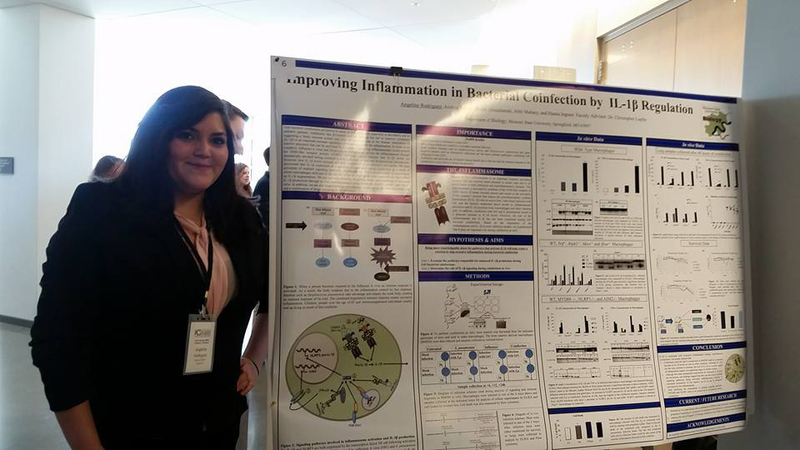 For the 2019 year, Angeline Rodriguez was honored in the biological sciences category for her research on Interleukin 1 beta’s effect on co-infections. 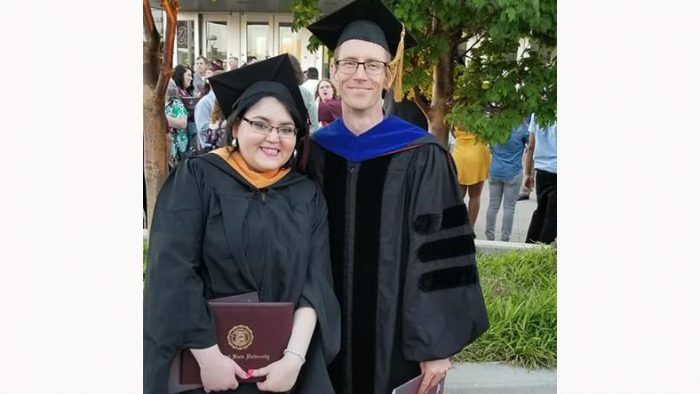 “It feels great to know that my thesis could actually be a valuable resource to incoming graduate students at MSU in the field of immunology,” Rodriguez said. Rodriguez focused on co-infections in her thesis. During flu season, Influenza A Virus (IAV) and Streptococcus pneumoniae (S.p.) band together to prey on weak immune systems, usually of infants or elderly people. The flu alone typically does not kill people. When the flu and another infection co-infect someone, it leads to excess mortality. Rodriguez’s research looks at one specific protein that comes from immune cells — cytokine. It lets the body know what’s going on and initiate processes for the body to fight infection or let it ravage the body. Interleukin 1 beta is a cytokine that activates other cytokines. Rodriguez wanted to know why this specific cytokine was important during the co-infection process. Throughout her research, she learned about specific proteins and complexes within pathways. She explored therapeutic options involving the cytokine as well. She hopes that future research will be done to find more specific components in the cytokine. Despite the hurdles, she still managed to make it work. One thing she struggled with in the beginning was finding new solutions on the spot. She needed to learn to be okay with starting over. She started to problem solve. Rodriguez is currently pursuing a PhD in biomedical engineering. She is researching Systemic Sclerosis/Scleroderma, an autoimmune disease, at the University of Arkansas in Fayetteville. Wesley Weichert was honored in 2017 in the mathematics, physical sciences and engineering category. His thesis may be sent to the Midwest Association of Graduate Schools (MAGS) Distinguished Thesis Award. Rodriguez’s thesis will be considered for MAGS in 2020.